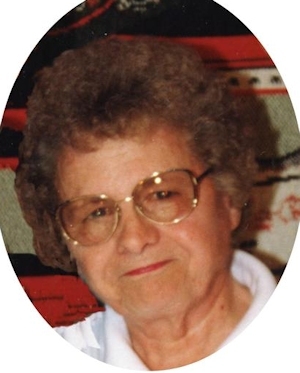 Obituary – Chrz, Velma Mae (Hendren) « Perry High School Alumni Association, Inc.
Velma Mae Chrz, 89, of Perry, Oklahoma, was the daughter of William Bryan and Evelyn Alexander Hendren. She was born February 20, 1924 in Perry, Oklahoma and died Wednesday, August 14, 2013 at Green Valley Nursing Home in Perry, Oklahoma. She attended and graduated from Perry High School. Velma married her best friend and sweetheart, Ralph Charles Chrz on August 11, 1946 in Perry, Oklahoma. Velma and Ralph were married for sixty-seven years and were truly life partners. They enjoyed being part of Bryan’s activities growing up and spending time together on the farm. She will always be remembered as a very loving person. Velma loved her family and close friends and spending time with not only them but her grandchildren was her greatest joy. She was so proud of each and every one of them and enjoyed being able to be a part of not only their lives but being able to watch as their families grew. Her great-granddaughters were very precious to her. Velma had a very special relationship with her twin sister, Thelma who she was dedicated to taking care of and loved the time they had together. She even volunteered at the nursing home while spending time with her sister. She was a member of the American Legion Auxiliary. Velma was an active member of the First Baptist Church of Perry, Oklahoma and taught Sunday school there for thirty years until her health declined. Funeral services will be held 10:00 a.m., Saturday, August 17, 2013 at the BrownDugger Funeral Home Chapel in Perry, Oklahoma. Chaplin Gene Owens will officiate. Interment will be at Grace Hill Cemetery in Perry, Oklahoma. Services are under the direction of BrownDugger Funeral Home. Memorials may be made to the American Stroke Association in care of BrownDugger Funeral Home, 1010 N. 7th Street, Perry, Oklahoma 73077. Velma is survived by her husband, Ralph of the home son, Billy Bryan Chrz and his wife, Billie of Perry, Oklahoma five grandchildren, Amy Harman and her husband, Aaron of Broken Arrow, Oklahoma, Allyson McGinnis and her husband, Ben of Tulsa, Oklahoma, Jarrett Chrz of Tulsa, Oklahoma, Abbey Chrz and Will Chrz both of Perry, Oklahoma two greatgrandchildren, Juliet McGinnis of Tulsa, Oklahoma, Avery Harman of Broken Arrow, Oklahoma. She was preceded in death by her parents, Bryan and Evelyn Hendren and her twin sister, Thelma Hendren.